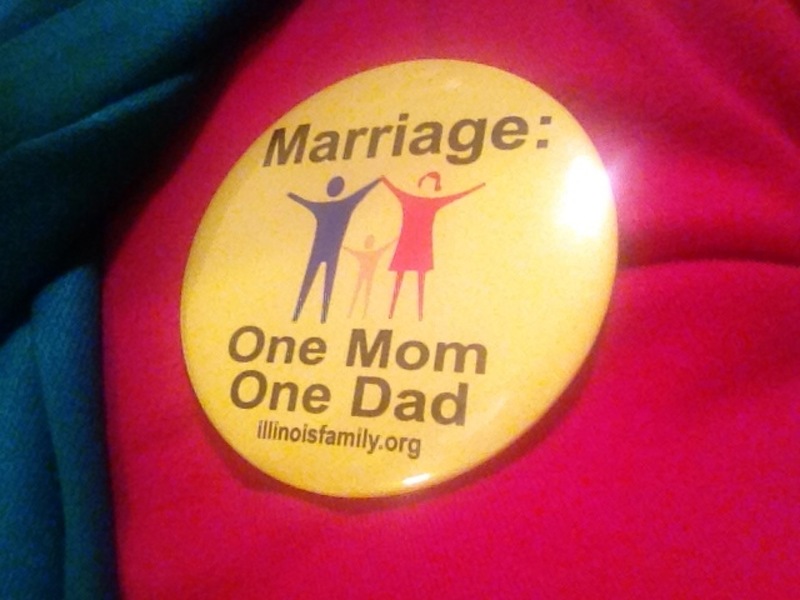 “I like it,” I said to my husband yesterday at the Defend Marriage Lobby Day at the Illinois state capitol building. I was referring to the yellow button we had each been handed at the registration table. Still, I found myself fighting back tears as we stood in line waiting to talk to our state representative. Here we were, a barren couple, wearing buttons which publicly exposed our shame. My husband and I are one man and one woman brought together in marriage, but we are not one dad and one mom; and the truth stings. But, it is still the truth. That’s what marriage is, really. It’s God’s good ordering of His creation. It’s not passion and attraction and preference and romance, though – don’t get me wrong – it is a delight when marriage includes such things. Marriage is God’s blessed institution of the family unit in life. It is one man and one woman joined together that they might be one dad and one mom. We know this to be true, because it is the one flesh union of husband and wife over which God spoke the blessing of children in His words “be fruitful and multiply” (Genesis 1:26-31); it is the distinct parental unit of dad and mom which God commands children to obey in His words “Honor thy father and thy mother” (Exodus 20:12). It is the unique joining together of husband and wife which Paul uses as a picture of Christ’s relationship with His bride, the Church, when he writes, “‘Therefore a man shall leave his father and mother and hold fast to his wife, and the two shall become one flesh.’ This mystery is profound, and I am saying that it refers to Christ and the church” (Ephesians 5:22–6:4). That’s why even the barren can confidently confess to the world that marriage is one dad, one mom. Though the cross of childlessness weighs our shoulders with grief and pain (and sometimes, on days like yesterday, shame), it does not make our marriages null and void. We are still fruitful in marriage as man and wife, even though God in His wisdom has not blessed us insofar as to multiply. Soli deo gloria. Posted in Grief, Infertility, Marriage, Men on October 24, 2013 by Katie Schuermann.